A while back I was lamenting the lack of Omega 3s in my life. I've been taking a DHA supplement that's recommended for nursing moms like me and because of my fish allergies, it has to be vegan. There aren't so many on the market! As I read the ingredients of the one that was recommended to me, I was surprised and happy to see that ingredient #2 is sunflower oil. I eat a ton of sun butter but I wondered what else I could do with sunflower seeds? Maybe I could make my own sun butter? I could add them to salads, certainly, and with oatmeal for breakfast. I'm excited to tell you that I've been consuming sunflower seeds like crazy! But I'm sad to report that as of yet, I have not found a good recipe for my own sun butter (and I've tried making it at least 10 times!) I'll post the recipe as soon as I come up with one that satisfies me. Here's today's daily dose of sunflower seeds - a simple salad for my lunch with arugula, avocado (another thing I cannot get enough of lately), raw carrot slices and dried cranberries, topped with raw sunflower seeds and drizzled with olive oil and lemon juice. Omega 3s and Kids. Where and Why? In general, my family eats a well balanced diet. Whole grains, lean meats, lots of fruits and vegetables. But because of my severe food allergies, there are certain foods that are never even brought home, like fish and certain tree nuts. All those health benefits of fish? Unfortunately we don't reap them. Here's the bad news: as it turns out, fish and nuts have really high amounts of Omega 3 fatty acids, hailed as nutrition superstars. They are said to help the body reduce inflammation (and therefore help with things like heart disease and arthritis), reduce triglycerides, improve brain function and aid things like fatigue and dry skin. And according to Parenting.com, "Low levels of DHA [an Omega 3 fatty acid] in children have been linked to an increased risk of ADHD, vision problems, and depression." Thanks to my allergies, we all have to be more creative to get our fill so we don't fall into a pit of Omega 3-deprived despair! Ugh. Here's what I've learned: There are three types of Omega 3 fatty acids: ALA, DHA and EPA. ALA (alpha-linolenic acid) is primarily found in plants like nuts, beans, flaxseeds and leafy greens. DHA and EPA are found mostly in cold water fish like salmon and sardines. DHA can also be found in fortified milk, eggs and other dairy. 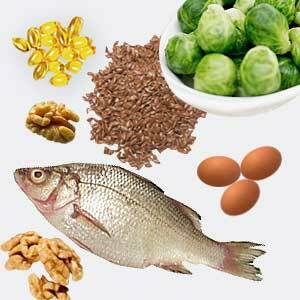 I found this slide show about the top sources of Omega 3s interesting. So okay - back to the action plan. For anyone like me who can't have the so-called "best" sources of Omega 3s, you can buy organic eggs with added Omega 3, other dairy fortified with Omega 3. Frankly, I have no clue how Omega 3 can be added to eggs so I need to do more research. Another option is to include flax, spinach and green leafy vegetables as a regular part of your diet. My husband and I eat loads of leafy greens but beyond the Weelicious Green Monster smoothies, my kids really don't. I've started adding flaxseed meal to almost everything I make for the family (pancake batter, oatmeal, baked goods, cereal, smoothies, salads) but I just read that the best benefits come if you grind them right before using. Man! I'm using these anyway and keeping fingers crossed that we can get at least some of the benefit. I grew up on Flintstone's vitamins. Do I need to give my kids a supplement of some sort for them to get the benefits of Omega 3 fatty acids? Google "Kids Omega 3s" and a whole host of supplements and vitamins turns up in the results. In truth, I'm hoping that if Omega 3 fatty acids are, in fact, as beneficial as they are touted to be, that scientists figure out some non-fish, non-nut based way to unlock their awesomeness that doesn't involve me manually grinding seeds on a daily basis.